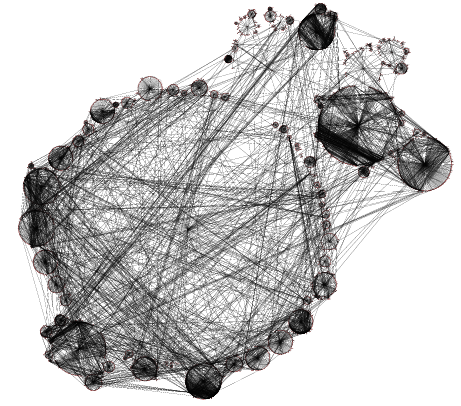 Eytan Adar (veteran social media grapher) pointed me to this paper (Lehmann and Kottler) on graph layout which contains an interesting example in the form of LiveJournal data. The fundamental difference between this type of layout algorithm and those I've put on this blog before is that here analysis of the graph is used first to determine localized layout - compare this with the popular force layout approach which looks for a global optimization of layout. LJ is indeed a scale free network with degree exponent surprisingly close to the exponent found for the network of sexual contacts. The average distance from one user to another is a little bit smaller than 6, as it was already predicted. 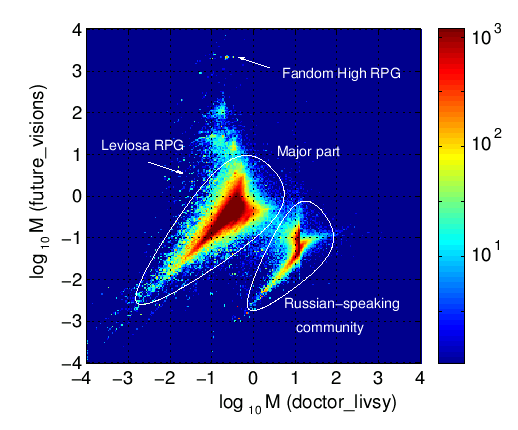 The community structure (do not confuse with LJ community engine) is dominated by small (< 300 users) RPG cliques and one huge Russian-speaking cluster (220 thousands of users). we start by giving some amount of money to some user (initiator) in LJ network telling him to evenly distribute it among his friends, then his friends are performing the same action among their friends and so on. Obviously, if these guys are the members of some clique it will not take too long until all of them have an equal amount of money (thanks to small-world property), meanwhile only some small part of the initial amount will leave this community. So the amount of money of a particular user defines his thermodynamic distance from the initiator. If we have two initiators - we can plot the figure like the one shown here. This is certainly something I will have to try out on the data I've been playing with.